(2) 3M Reflective Generator Warning Decals. (1) 3M Reflective Grounding Decal. (1) 3M Reflective Feed Through Conductor Decal. Instructions for proper decal placement. Convenient packaging keeps decals fresh and clean. Same day Priority Mail shipping. Sold as a "kit" to ensure that your new generator installations meet current code requirements. 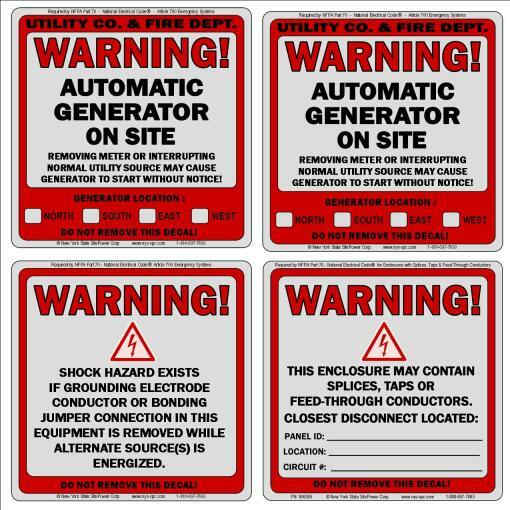 Approved by Electrical & Building Inspectors, each pack contains (2) Generator Warning Decals and (1) Generator Grounding Decal and (1) Feed Through Conductor decal for each generator installation.